Move over, interwebs, the print media still exists! Thank you, Lee Littlewood, for the shout out in this round up of Halloween books that are sure to destroy innocent lives and cause sleepless nights. I mean: inspire reading! I’m glad to be included. These new books are super fun and help kids get in the mood for the year’s spookiest holiday. 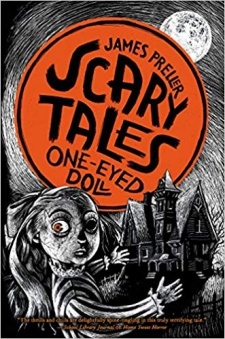 Dedicated to the memory of The Twilight Zone and host Rod Serling, Scary Tales: One-Eyed Doll — a little paperback with larger text and a clear, classic writing style — is a slightly shock-worthy story that’s fun and spine-tingling. It stars a brother and sister who love to explore the woods and an old house near their home. They particularly enjoy treasure hunting, this time with neighbor “Soda Pop,” who helps them discover a creepy one-eyed doll witch with lots of scary havoc to wreak. The fifth in James Preller’s “Scary Tales” series (the next is Swamp Monster), the quick reads, peppered with spooky black sketches, make fun Halloween reads for 8- to 10-year-olds.